The original photo that I found and began researching. A couple of years ago I found an old black and white photograph of what appeared to be a college, or maybe high school, football team. While finding an old football photo is nothing special, this photo had my maternal great-grandfather in it (James P. Fitch). I instantly recognized him but I had no idea what team or school the photo was of. The only identifying information that was ascertainable from the photo itself was the word “Normals ’08,” that someone had written across the bottom of the photo. There was also the coach, who was standing behind his players, wearing a white sweater with a logo that I couldn’t quite make out. The logo appeared to include a “T”, a triangle, and an “S”, although I wasn’t entirely sure. It wasn’t a lot of information to go off of, but with that, I began my search for the source of this photo. I knew a lot about my great-grandfather but for some reason I didn’t know where he had attended college. I started searching for Normal schools in states where he had lived as a young man. As you can imagine, this didn’t narrow my search very much as there were a lot of Normal schools in the late 1800’s and early 1900’s. I also tried searching for the logo, but that didn’t yield any results either. This wasn’t too disappointing as I knew that even if I found the logo, it might not be for the same school that my great-grandfather had attended. After all, it is not like schools during this time period had Nike contracts for their athletic apparel, and the coach’s sweater could have been from another school (or anywhere else for that matter). In other words, there was a very real possibility that the logo had nothing to do with this particular school or team. I continued searching and put in an inquiry with a college football historical research group that I am a member of, but that turned up very little information. Everywhere I looked, I found another dead-end, and I was having a difficult time figuring out what school this photo was of. After a lot of searching, the only information I had was that my great-grandfather was in the photo, it was a “Normal” school, and the year was 1908. I started to think that I would never figure out what school my great-grandfather had attended. My biggest fear was that the school was a small college, located in the middle of nowhere, that had long since demised without a trace, and thus there was little chance that I would ever learn of its existence. Fortunately, I finally had a breakthrough. The photo I found online with the attached caption, giving the name of the team coach. My searching led me down many paths, most of them dead-ends, but all worth following with the hope that there might be a light at the end of the tunnel in the form of a small clue. While following one particular lead, I stumbled upon another copy of the same photo. It was hosted online and appeared on a blog (that I can no longer find). However, this “new” version of the photo contained a caption that gave the name of the head coach, “A.A. Mason.” Further, the blog was dedicated to the history of the University of Central Missouri (UCM). This was all the information I needed in order to identify the school, and within minutes I learned that the photo was of the 1908 Missouri State Normal School (District No. 2, Warrensburg, Missouri) football team. UCM was originally the District 2, Missouri State Normal School located at Warrensburg, Missouri (also referred to as “MSNS No. 2” or “MSNS”). As I began researching the history of MSNS No. 2, I found three documents on Archive.org which helped me identify more information regarding the history of the school, as well as what years my great-grandfather attended the school (see below). Obviously, I already knew that he was on the 1908 football team, but I wanted to find out if he had played during any other seasons and if there were more team photos (unfortunately, I haven’t been able to find evidence of him playing during any other season). “Vol. IX – July 1908 – Number 1: Bulletin and Thirty-Eighth Annual Catalogue of the State Normal School (Second District of Missouri) and Announcements for 1908-1909” (Link – from the University of Illinois). On page 105 of this first book, it lists my great-grandfather as a student enrolled in summer school 1907 (listed as: Fitch, James – From Johnson County). However, it appears as if he left school after that summer, before the start of the 1907 fall semester, as he does not appear in the list of students that begins on page 117 titled “Enrollment from September 10, 1907 to May 29, 1908.” Assuming this is accurate, he most likely did not play football on the 1907 team. “Vol. X – July 1909 – Number 1: Bulletin and Thirty-Ninth Annual Catalogue of the State Normal School (Second District of Missouri) and Announcements for 1909-1910” (Link – from the University of Illinois). My great-grandfather is listed on page 105 (as Fitch, James – From Johnson County) among the students enrolled in summer school 1908. Apparently he had returned to MSNS that summer in order to continue his education. More importantly, he is also listed among the students who were enrolled from September 15, 1908 to June 3, 1909 (page 123). 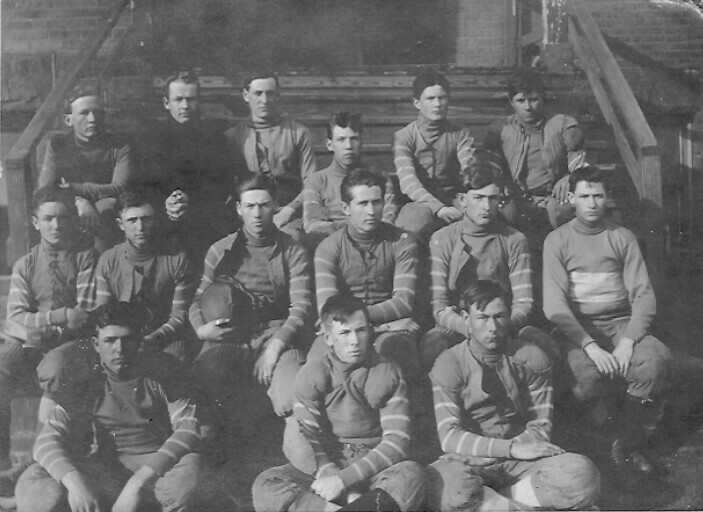 This would place him as an enrolled student during the fall of 1908 and confirms the football team photo which is dated 1908 (or ’08). “Vol. XI – July 1910 – Number 1: Bulletin and Fortieth Annual Catalogue of the State Normal School (Second District of Missouri) and Announcements for 1910-1911” (Link). Again, my great-grandfather is listed on page 130 as a student who was enrolled in summer school 1909. However, the list of students who were enrolled from September 14, 1909 to May 26, 1910 starts on page 143, and my great-grandfather is absent from this list. However, I have since confirmed via the UCM Archives that my great-grandfather was a senior in 1909 (or, at least, that he is listed as a senior in the 1909 year book). This would explain why he was not an enrolled student during the fall of 1909, as he would have most likely graduated after his 1909 summer school session (the UCM archivist that I spoke with also told me that he does not appear in the 1909 football team photo). I have been unable to find any more of the above referenced MSNS publications after the July 1910 book or before the July 1908 book. According to these documents my great-grandfather attended MSNS in the summer of 1907 before leaving and returning in the summer of 1908, at which time he remained enrolled through the summer term of 1909. 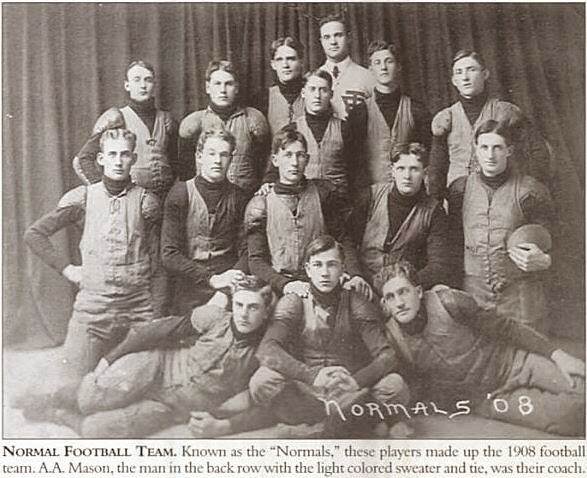 While I have been told that he was a senior in 1909, I have been unable to determine if he attended MSNS before the summer of 1907; however, for the purpose of identifying the “Normals ’08” football team photo–that question had been answered. As you can tell by the “No. 2” part of the MSNS name, at the time the photo was taken there were several Missouri State Normal Schools (I believe there were four districts and thus four MSNS schools). The one in Warrensburg, Missouri was founded in 1871 as Normal School No. 2 (or Missouri State Normal School at Warrensburg). MSNS changed names several times throughout its history and, as of 2006, is now known as the University of Central Missouri (UCM). It is still located in Warrensburg, Missouri. The most disappointing aspect of the previously mentioned three documents that I found on Archive.org for MSNS No. 2 is that they do not have much information that is specific to the football team. However, the MSNS No. 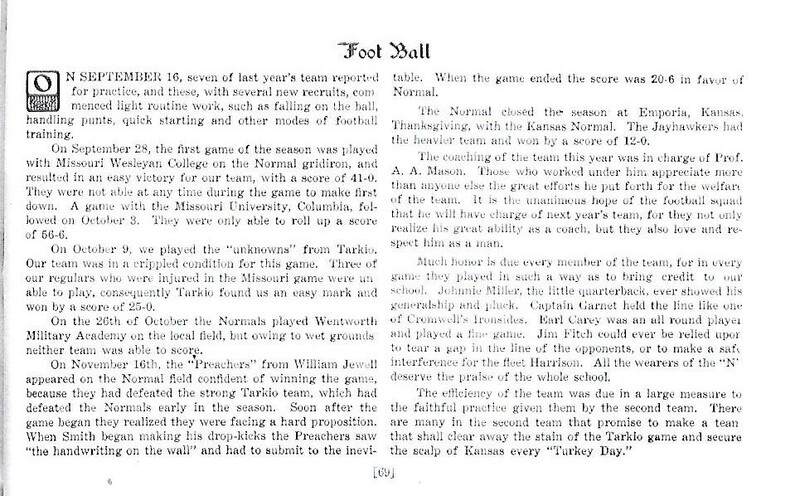 1 in Kirksville, Missouri was pretty good about documenting their football team, as is evidenced by the photographs and information contained in their similar publication for MSNS No. 1 (Vol. IX – June, 1909 – No. 1: Bulletin of the First District Normal School, Kirksville, Missouri – Link). I was thrilled to have finally solved the mystery of where my great-grandfather had played college football (this information has since been added to his Wikipedia.com page). However, now that I knew where he played, I wanted to know more about his team and his time at MSNS. Unfortunately, that information is a lot harder to come by without the help of an archivist at UCM. Fortunately for me, I have found a very helpful archivist that has provided me with some great information. She sent me a copy of the team photo from the 1909 yearbook that lists the last names of all the players in the 1908 football team photo. Here is a copy of the photo from the 1909 yearbook with the last names of each player. Clyde C. Curnutt (Johnson County, MO) (I could not determine if he is related to Martha Mary Curnutt. Here are a few other items on Mr. Curnutt – 1930 Census, 1900 Census). * September 16, 1908: Seven players from the 1907 team, and seven (?) new players report for practice. * Some of the schools listed on this 1908 schedule are either no longer in existence, operating under a different name, or have become part of another school. Football records for these particular schools are difficult to find, and I will update this post as I find more information. I believe this to be the same as Missouri Wesleyan (Cameron). Today known as the University of Missouri (Columbia, Missouri). 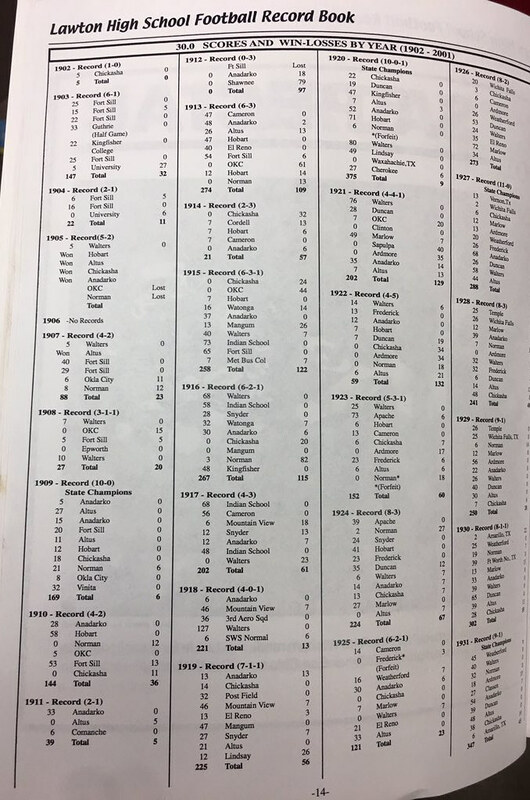 This date is from the University of Missouri’s “2015 Mizzou Football Records Book” (or Record/Media Guide Supplement) found at MUTigers.com (see page 39 of the 2015 book – Link). I believe this to be Tarkio College in Tarkio Missouri (see also – Link). Wentworth Military still exists today as a prep school offering both high school and college level courses. I have been unable to locate any of their historical football records. Kansas St. Normal (Emporia) is now Emporia State University. As a side note, while the 1908 season was not a championship season for MSNS, I did notice that, according to the same 2013 UCM media guide, MSNS was “Missouri-Kansas Inter-State Champions (7-2-0)” in 1907. I also noticed that Phog Allen became the head football coach at MSNS in 1912 and coached football through the 1917 season. Under Coach Allen, MSNS won the MIAA Championship in 1912, 1913, 1914, and 1915 in football. 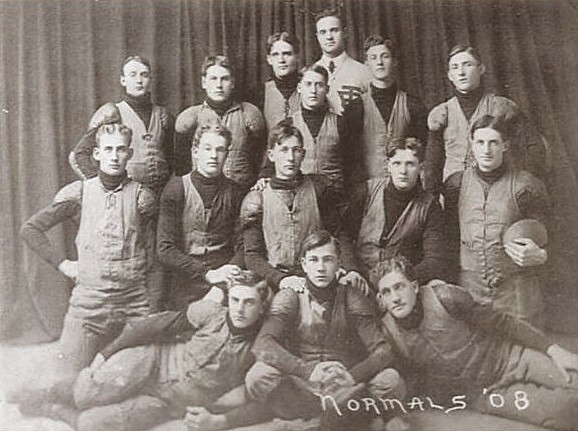 In 1918 MSNS did not field a football team due to World War I, but Coach Allen stayed on to continue coaching basketball through the 1918-1919 basketball season. By late 1919, Coach Allen took a job at the University of Kansas coaching both football and basketball (and of course, the rest is history in terms of KU basketball). My great-grandfather missed these championships, and Phog Allen, by just a couple of years. After graduating from MSNS, my great-grandfather was later hired by the Boy Scouts of America (BSA). The BSA was in its early stages of development and he played an instrumental role in developing and expanding the Boy Scout program throughout the U.S. You can read more about James P. Fitch’s scouting career, including his influence on the creation of what would become Philmont Scout Ranch, his career as the Region Nine Scout Executive, and his time as Assistant Chief Scout Executive, on his Wikipedia.com page. In fact, there has been a lot of information written on James P. Fitch’s scouting career. The following are some of the books, and other items, that were either written about James P. Fitch or contain chapters dedicated to him. A few other highlights from his Scouting career are that: (1) he was the first Region Scout Executive (Region Nine: Texas, Oklahoma, and New Mexico) from 1919–1945; (2) he was awarded the Silver Antelope; (3) he was the General Manager of Philmont Scout Ranch and Phillips Properties from 1945–1949; (4) he was the Assistant to the Chief Scout Executive from 1949–1952; (5) he earned the rank of Eagle Scout in 1914; (6) he was the Camp Master at Owasippe (near Twin Lake, Michigan) in 1915 and originated the “Tribe of Owasippe” in 1916; and (7) he was in attendance at the opening ceremonies for Worth Ranch, a Boy Scout camp located in Palo Pinto, Texas. However, despite the large amount of information written on his Scouting career, there has been very little written on the rest of his life (before and after his time working for the Boy Scouts of America) and that is the focus of this post, obviously. Soon after I posted this article, my parents found an envelope containing a photo and newspaper clipping regarding Vinita High School in Vinita, Oklahoma. The envelope had a return address of “Boy Scouts of America, North Brunswick, New Jersey 08902,” and was addressed to James P. Fitch’s wife at 6207 Bryan Parkway, Dallas, Texas 75214. The envelope itself may have had nothing to do with the enclosed photo and newspaper clipping, but I am not entirely sure. My maternal grandfather, William D. Fitch (James P. Fitch’s son), had made some handwritten notes regarding the photo and newspaper clipping. 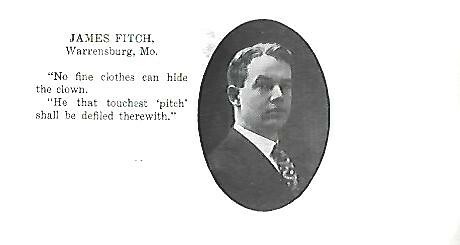 His notes stated that James P. Fitch: (1) was a 1909 graduate of “Warrensburg Normal, Mo.,” (2) first began his work in scouting with a troop in Vinita, Oklahoma in 1910 (the B.S.A. started in the U.S. in 1908), (3) coached Vinita High School to the 1911-1912 football championship, and (4) was later hired to coach football at Lawton High School in Oklahoma. The newspaper article/clipping was from the Vinita Daily Journal newspaper, but, unfortunately, the date line is cut off from the top of the page. However, there is some information on the back side of the clipping that indicates that it is from November 1972. In 1908 the decision of Willie Halsell College to close its doors made it possible for the Vinita school system to obtain use of this building for high school classes. That year Supt. Masterson started a sophomore class, in 1909-10 a junior class and the first senior class in 1910-11. With a complete high school program, four teachers formed the faculty for the Vinita high school with J. P. Fitch as principal, Miss Mary E. Johnson, Miss Effie Quigley, and J. E. Sullivan. There were 10 seniors, 15 juniors, 14 sophomores and 25 freshmen in that first year of a full high school system. So, apparently, James P. Fitch was the first principal of the full four-year Vinita High School and was also the football coach, leading them to a championship in 1911. 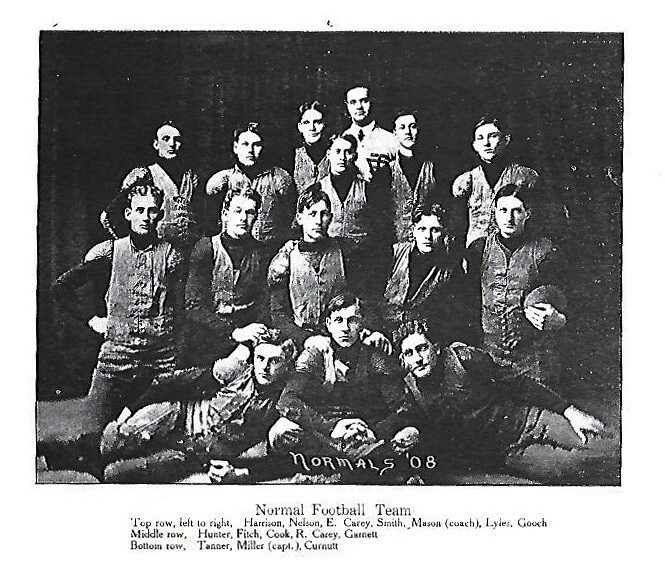 Photo of the Vinita HS 1911 championship football team (James P. Fitch on back row). Since writing this article, I have contacted a guy from Lawton High School in Oklahoma who is one of their assistant football coaches. 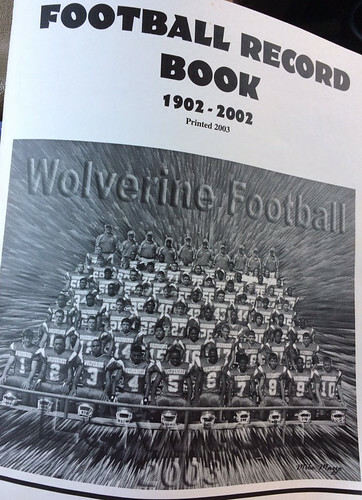 I asked him if he had any information on my great-grandfather and he sent me a copy of their “Football Record Book, 1902 – 2002, Printed 2003, Wolverine Football, Lawton 2003” (a photo of this book’s cover is provided on the right). 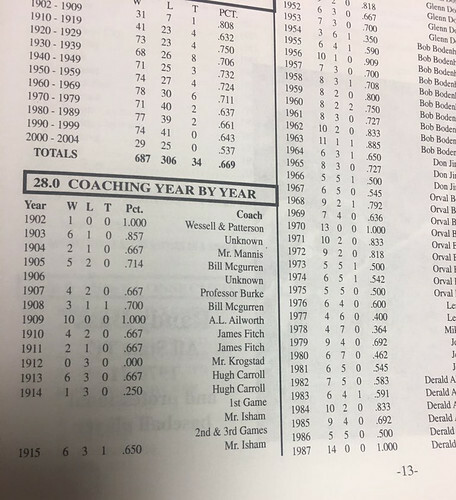 On page 13 of this book (see below), it has a list of all the Lawton High School head football coaches, and the years they were the coach (as well as the team’s record during those years). James Fitch is listed as having been the head coach in 1910 (4-2) and 1911 (2-1). Further, on page 14 (see below) of the same book, it shows the results for the 1910 and 1911 seasons. This information, if correct, would contradict the information found above which stated that he was the head coach at Vinita High School in 1911. I am guessing it is entirely possible that he was the head coach for both schools (at the same time) as football schedules in the early 1900s were usually unconventional; however, today Lawton and Vinita are about 350 miles apart, and that would have been a long way to travel in 1911. I will update this again if/when I find more information that clarifies the situation. There is a book that I know of that might help shed some light on the situation if I can ever find a copy. 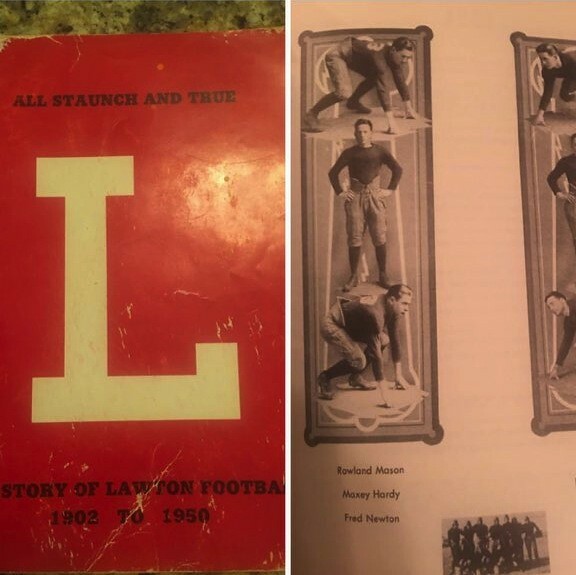 It is titled “All Staunch and True; The Story of Lawton Football 1902 to 1950,” by Dr. O.L. Parsons (see below). However, I have had a hard time tracking down a copy of this book, so if you are reading this and know where I can get one, please let me know! This entry was posted in History, TN and tagged 1908, Fitch, MSNS, Normal by Travis Normand. Bookmark the permalink.